A CAN gateway (or bridge) functions as an interface between different networks, enabling the possibility of connecting different CAN networks (or sub-networks) with different baud rates and protocols, or integrating with different network types, such as with Ethernet. 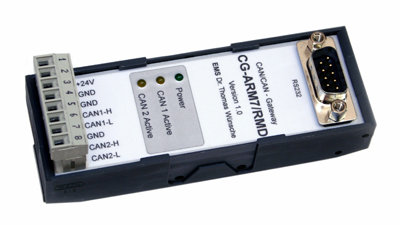 The CG-ARM7 CAN/CAN gateways function as gateway level interfaces between CAN networks. Star and tree structures as well as extensive line structures can be realized with their use. Available functionality includes data rate adaption, message filtering, and identifier conversion between the coupled busses. Design variants are also available, offering a variety of features, including galvanic isolation, (ARM7) software development support, high and low speed CAN bus support, and extended temperature operation. 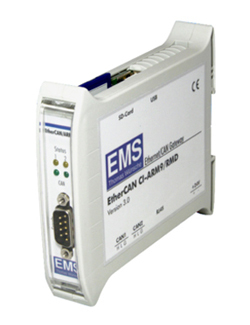 The EtherCAN CI-ARM9/RMD is a powerful rail-mounting embedded Linux based gateway for demanding CAN based applications, with connections for two CAN networks and 10/100Base-T Ethernet. Utilizing a powerful 454MHz Freescale ARM9 CPU, it is suitable for applications where processing of CAN messages in the gateway is needed, such as, visualization of CAN messages via web server, and complex protocol conversion. Higher Layer Protocol support is optionally available for CANopen and multiprotocol stacks, and a CANopen to TCP/IP gatway [CiA 309-3]. 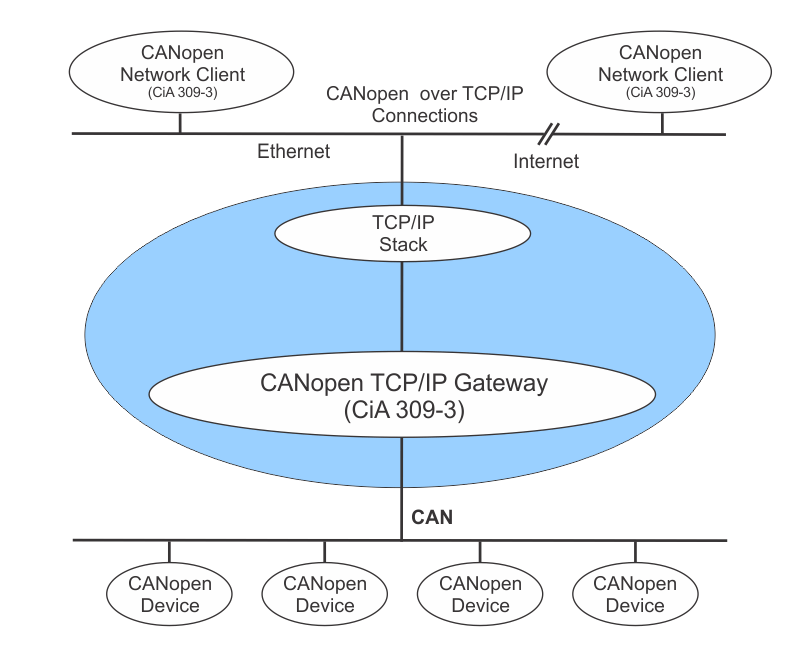 The CANopen TCP/IP Gateway (CiA 309-3) provides remote access to CAN based CANopen resources via TCP/IP according to the CiA 309-3 specification. The gateway is available in a variety of builds and configurations, including low cost binary versions for use on the EtherCAN CI/ARM9 CAN Ethernet Gateway, and for Windows or Linux PCs connected to CAN using any of the CPC series of (PCIe, USB) CAN PC Interfaces & Adapters. Sources are optionally available, as well as customer / application specific developed extensions. CAN bus requirements beyond Gateway Products? The above CAN bus Gateway products are complemented by an extensive range of PC Interface, repeater, fiberoptic, and distributed I/O interface products, providing the systems developer with a comprehensive toolkit for implementing a diverse range of CAN bus system implementations.